How does caffeine work in the brain? Drug molecules generally work by interacting with receptors on the surface of cells or enzymes (which regulate the rate of chemical reactions) within cells (see how do drugs work for details). Receptor and enzyme molecules have a specific three-dimensional structure which allows only substances that fit precisely to attach to it. This is often referred to as a lock and key model. This is the case for the caffeine molecule in coffee. Caffeine is the active ingredient in coffee. It is a bitter, white crystalline xanthine alkaloid that acts as a stimulant drug. Regular use of caffeine can cause mild physical dependence although it will not threaten your physical, social, or economic health the way addictive drugs do. But caffeine withdrawal can make for a few bad days. 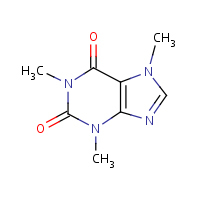 WHAT IS THE MOLECULAR MECHANISM OF THE CAFFEINE MOLECULE? Because the caffeine molecule is both water-soluble and lipid-soluble, it readily crosses the blood–brain barrier that separates the bloodstream from the interior of the brain. Once in the brain, the principal mode of action is as a nonselective antagonist of adenosine receptors (in other words, an agent that reduces the effects of adenosine). The caffeine molecule is structurally similar to the adenosine molecule, and is capable of binding to adenosine receptors on the surface of cells without activating them, thereby acting as a competitive inhibitor. 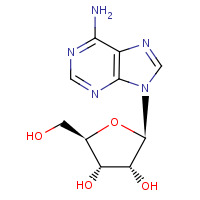 Below shows the static molecular structure for the caffeine molecule on the left and adenosine molecule on the right. Above are Jsmol applets for caffeine and adenosine. They are shown in stick model. To use Jsmol click on your right mouse button over the rotating image. You can go down to spin (turn off) to stop the motion. The A2 receptor protein is a member of the G protein-coupled receptor (GPCR) family which possess seven transmembrane alpha helices. The A2A receptor is responsible for regulating myocardial blood flow by vasodilating the coronary arteries, which increases blood flow to the myocardium, but may lead to hypotension. Just as in A1 receptors, this normally serves as a protective mechanism, but may be destructive in altered cardiac function. Caffeine competitively inhibits different adenosine receptors and their associated G protein to make a person feel alert. A mild stimulant of the central nervous system, caffeine also stimulates cardiac muscle, relaxes smooth muscle, increases gastric secretions, and produces diuresis. The A2A receptor also has important roles in the regulation of glutamate and dopamine release in the brain, making it a potential therapeutic target for the treatment of conditions such as insomnia, pain, depression, drug addiction and Parkinson's disease. Structure of the adenosine A(2A) receptor in complex with ZM241385 and the xanthines XAC and caffeine.